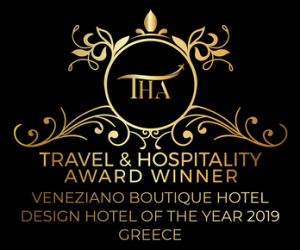 Veneziano Boutique Hotel is in a historic landmark building, in one of the most elegant architectural buildings of the city of Heraklion, has a beautiful interior courtyard and includes all the modern luxuries. The Architecture elements of Venetian and Ottoman era of this famous building have been restored and renovated with respect by the owners in collaboration with the local archaeological department. Over the years, the nations and the cultures that passed from Crete are reflected in the most vivid way through buildings that have survived to our days. One of those buildings – with the most elegant architectural elements in Heraklion, is the two-storey house located in the historic city center on the corner of the streets Nikou Kazantzakis & 1770 which is transformed in to a beautiful Boutique Hotel. 1510 and completed by adding one floor during the period of Ottoman occupation in 1730, in order to house senior officers. The main building was the residence of the first Aga of Heraklion and the building in the courtyard was his stable. In the courtyard there was a tower and from that point they could protect the Aga. In the basement were the baths of the house. The groundfloor is said to be the room where the stableman lived. The first floor was the Aga’s space where was his room and the room that accommodated his wives. The building is classified as “historical monument and a work of art” by the Ministry of Culture and the Ministry of Public Works. The Venetian and Ottoman elements of this charming building have been restored carefully, honoring the heritage of the building in collaboration with the local archaeological service. The building is a typical example of Venetian and Ottoman architecture and is set with a wooden roof. The use of wood characterizes the architecture and the morphological composition. The windows have a wooden frame and thin molding, while wooden jambs protrude slightly at the corners of the enclosed balconies. At the end of the structure there is a complex and wide wooden molding. The building is organized in two wings that form the letter “Γ” of the Greek alphabet with each other and define a large internal courtyard. Here was a meeting place for nobles and lords who were discussing various issues as economical, commercial, political that concerned the city, or they passed their free time. It was something like a combination of a chamber and a club. For this reason the building had five hidden exits in case of an emergency.